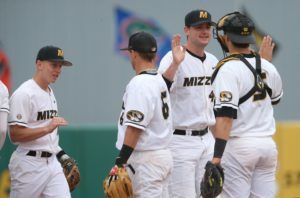 Mizzou Baseball has earned its third berth to the SEC Tournament in four years since joining the league after earning the No. 11 seed at the annual week-long event in Hoover, Ala. This is the first time that Mizzou has made back-to-b ack appearances in the tournament. Mizzou will open SEC Tournament action on Tuesday morning at 9:30 a.m. (CT) against sixth-seeded Vanderbilt. In all, Mizzou is 26-26 in conference tournament action, dating back to 1997 when Mizzou was in the Big 12 Conference. Mizzou’s last conference tournament championship came in 2012 when Mizzou went 4-0 in the Big 12 Tournament, defeating Texas, Texas A&M, Kansas and Oklahoma to claim the championship and qualify for the NCAA Tucson Regional. Mizzou first qualified for the SEC Tournament in its first season in the league in 2013, losing a marathon 17-inning game with eventual College World Series participant Mississippi State in the opening round. Mizzou then missed the tournament in 2014 before earning the No. 7 seed a year ago. Mizzou went 1-2 last year, winning the opener over South Carolina, 5-1, before dropping the next two games to Vanderbilt and Alabama. In all, Mizzou is 1-3 all-time in the SEC Tournament.